This beautiful exhibit dated 1658, is a magnificent example of an early box clock. We have chosen to focus on this clock as it summarises the theme and title of the exhibition, Innovation and Collaboration. Salomon Coster, born c 1620, was a Dutch clockmaker, who made the one of the first – if not the first – pendulum clocks in 1657, which had been invented by Christiaan Huygens. John Fromanteel, the son of Ahasuerus, worked for Coster and on September 3, 1657 – coincidentally, the opening day of our exhibition, albeit 361 years later! 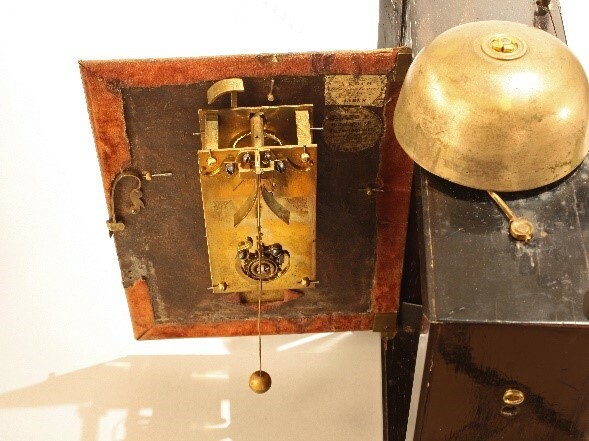 – a contract was signed between Coster and Fromanteel, which allowed the English clockmaker to continue making pendulum clocks such as the one created and taught to him by Coster. Whilst signed and dated by Salomon, this clock’s movement was in fact made by John Fromanteel. There are only about six of these original box clocks surviving, made 360 years ago. Additionally, this particular model seems to have a unique selling point – an alarm! It’s fascinating to think that the clock may well have sat within a bedroom and rang out to wake its owner and signal the beginning of a new day. 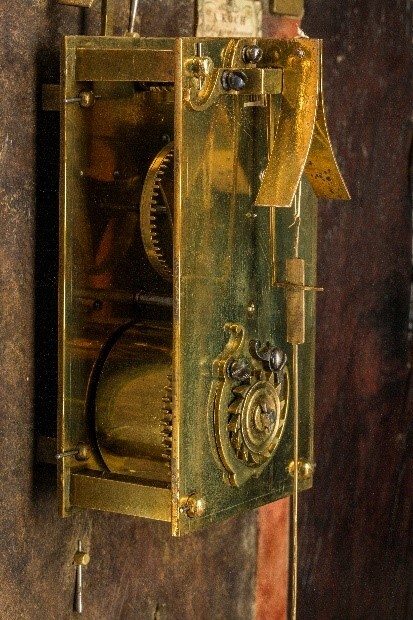 Another interesting aspect to feature on this clock is that the set-up springs have been moved from being hidden on the movement side of the backplate, onto the outside, and turned into an aesthetic feature. That development takes place in the movements made by Fromanteel signals further accuracy that he was not simply an apprentice who was learning the basics of applying a pendulum to a verge escapement, but a talented clockmaker in his own right. Pendulum clocks as we know, were heralded as a new beginning of the horological world, due to their accurate timekeeping, previously unheard of. This example of a pendulum clock highlights both innovation and collaboration.